I was asked to make a cake for my friends granddaughter’s sixth birthday. 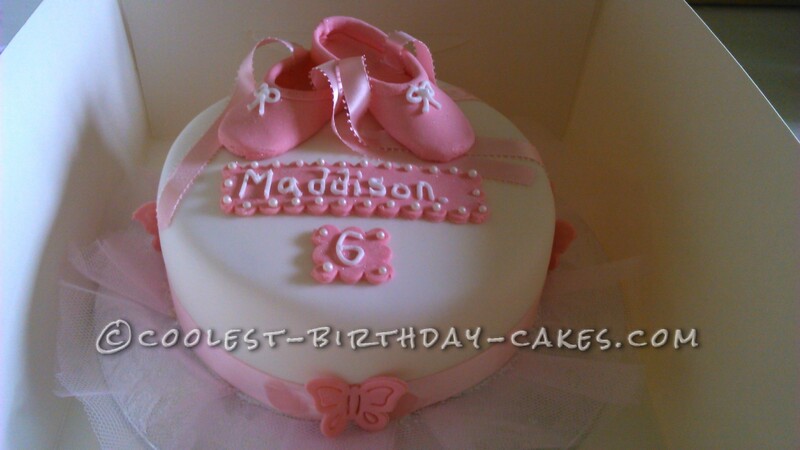 She told me she did ballet so I decided to make a ballet shoe cake. I made my usual Madeira cake and sandwiched and covered it with butter cream, then covered it with white icing. I covered the cake board with pink netting to represent a tutu then used a thin board the same size as the cake on top on which to set the cake. I modeled the shoes from modelling icing covered them in pink shimmer dust and added pink ribbon. 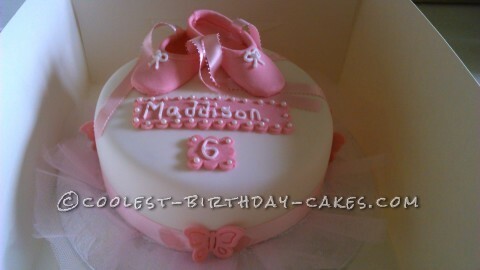 I placed pink ribbon around the bottom of the cake and added pink butterflies that I had made using pink modelling icing around the sides. I finished by making two plaques, added pearl dragees and then piped the name and age on the plaques of the recipient.